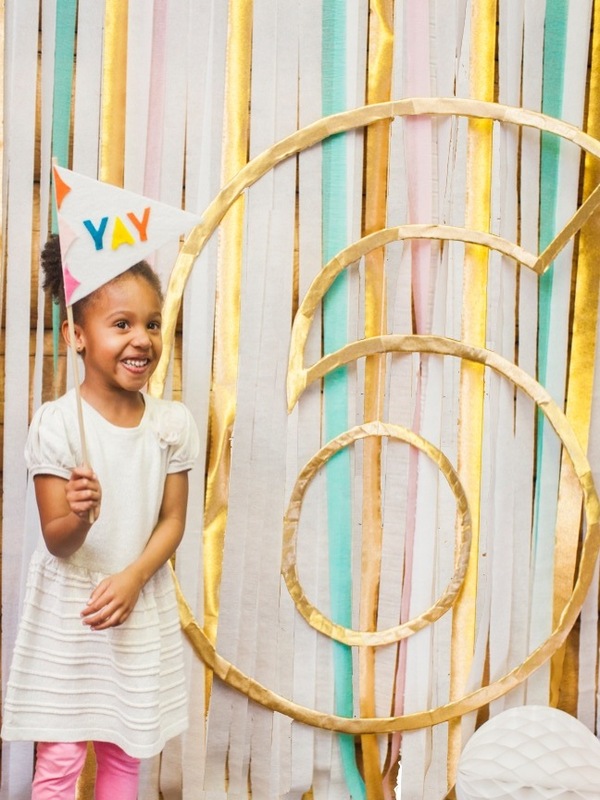 One of the easiest ways to add fun and style to your birthday party venue is to create a great photo booth. 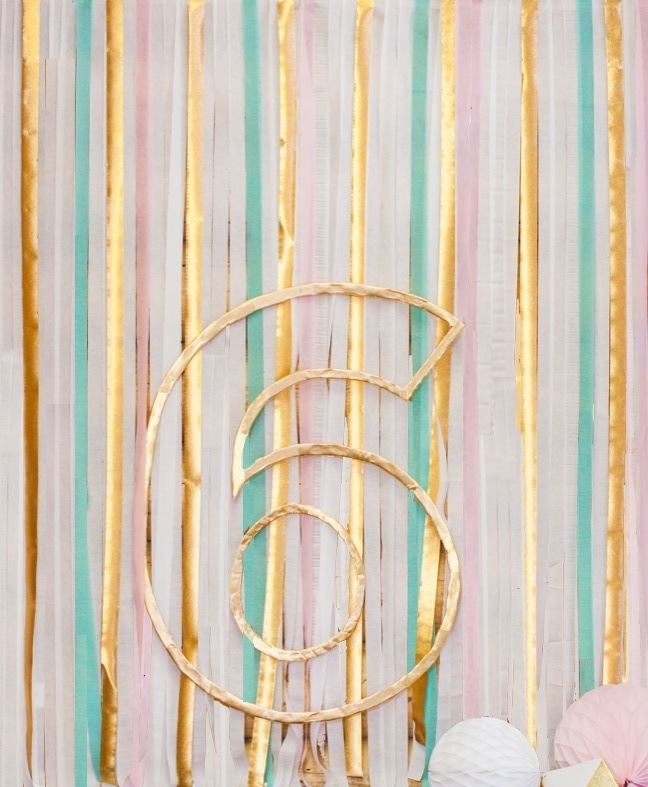 To celebrate kiddo’s new age, I designed this DIY metallic number outline photo booth backdrop. 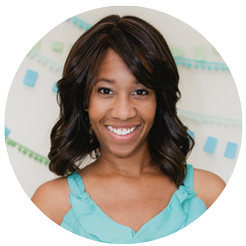 Photographer Sydnee Bickett helped me capture this fab feature from kiddo’s bash. After layering lots of crepe streamers in our palette, it was time to suspend this floating, see-through, giant numeral to stylishly broadcast my girl’s grownup status. OK, six isn’t grown, but it sure feels like she’s practically an adult. Step 1: Using a word processing program, create a two foot tall numeral for the birthday child’s upcoming age. Print and carefully cut out the number. Step 2: Use a small binder clip’s raised metal arms to clasp the number in an upright position. Position a flashlight behind the number to project it onto a wall. Move the flashlight closer or farther from the number to achieve a shadow in your preferred size. Step 3: Cut the cardboard box to create a flat surface large enough to trace your projected number. Tape the box to the wall for stability, or have another person hold it still while you trace. Step 4: Place the cut-out number on the floor, and cut it out of the box using a utility knife. Trace inside the perimeter of the number to create a two-inch wide border. Using the utility knife, cut along this line to create the cut-out outline of the number. Step 5: Starting on the backside of the number, tape the end of the gold streamer. Bring the streamer to the front of the number, and continue wrapping it around it the number. For curved portions of the number, wrap in a slightly diagonal angle as you would to wrap ribbon around a wreath. Once completely covered, tape the end of the streamer to the back side of the number. Step 6: Using fishing wire, suspend your number near your photo booth. For a 6, suspend the inner circle using fishing wire attached at the top and bottom of the smaller circle.